The mission at our animal hospital is to provide the highest level of quality veterinary medical care to our patients at an affordable price. We will provide our clients with the best in office experience and friendly environment. We take a hands-on approach to health education and animal care ownership, including public health, preventative care, and pet safety awareness. We strive to exceed our clients' expectations by treating all patients and their owners with respect, honesty, empathy, and compassion. 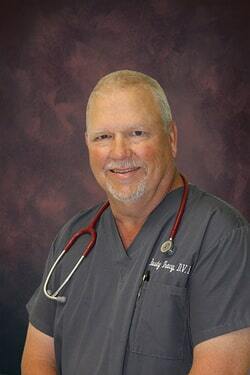 Dr. "Rusty" Tracy graduated from Texas A&M University with a bachelor of science in Biomedical Science in 1979 and Doctor of Veterinary Medicine in 1984. He is a member of the American Veterinary Medical Association (AVMA) and his sub-specialties include soft-tissue and orthopedic surgery. Dr. Tracy has been providing exceptional veterinary care to his patients in Cypress, TX 77429 and the surrounding areas for over 30 years. Although he has had clients move to different areas in the Houston Area Metroplex, many still drive to his practice for their pet's care. Out of his compassion for animals, Dr. Tracy is driven to continually improve the care provided at his pet clinic and values loyalty and trustworthiness above all. ​Dr. 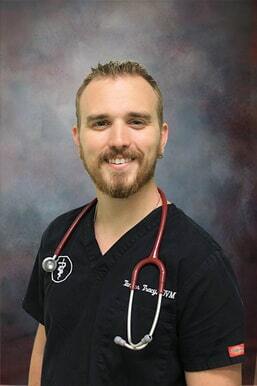 Tanner Tracy graduated from Texas A&M University with a bachelor of science in Biomedical Science in 2012 and Doctor of Veterinary Medicine in 2015. He is a member of the American Medical Association (AVMA) and his sub-specialties include soft-tissue and orthopedic surgery. Dr. Tanner Tracy enjoys making a difference in the lives of his patients every day and has joined his father in providing an excellent experience to the client and delivering superior patient care. He values honesty, hard work, and family values. His spare time is largely spent outdoors going hunting, fishing, and doing watersports including wakeboarding and skiing. His family has two dogs, Apollo, a miniature Pit Bull mix, and Artemis, a Black Mouth Cur. Here at Tracy Animal Hospital we are one big family! Our veterinary staff is dedicated and caring. Each dog and cat that comes into our clinic is treated with love and the utmost care. Clients from Cypress, Texas and the surrounding areas have been trusting us with their pets for over 30 years - and that means everything to us! You can expect our staff to be friendly, helpful, knowledgeable, caring, dedicated, thorough and quick to respond. And you can expect pet care to be affordable. It's not just about the bottom line at our pet clinic. We work closely with pet parents, giving them the tools and knowledge they need to provide the best care at home. We appreciate the trust that you have in our vet clinic and in our veterinary staff, and look forward to helping your dog and cat live a long and healthy life. Our veterinarians, vet techs, kennel techs, and front desk staff all take great pride in providing excellent service & superior pet care. Tracy Animal Hospital is a full service veterinary clinic specializing in soft tissue and orthopedic surgery. We offer excellent small animal medicine and our pet services include routine healthcare, internal medicine, pet soft tissue & orthopedic surgery, dentistry, dog and cat boarding, senior pet care, puppy & kitten care, pet vaccinations, parasite prevention, pet allergy & skin care, and cremation services. We strive to provide superior service every day and will always recommend what is best for our patients.